Feeling like you’ve outgrown your current house? The experienced architects at Commonwealth Home Design can show you how to creatively and efficiently gain more space in your home. With housing prices back on the rise in Northern Virginia, you may want to consider a renovation or addition project before seeking a new home. Look up, look down, look around—you may find you have more room for rooms than you think! Aging homes are often filled with tiny, unused rooms that cramp modern lifestyles. This can be addressed by removing interior walls and expanding important rooms like the kitchen or creating new family gathering spaces, like a great room. Before you remove any wall, you must determine if the wall is load-bearing. The experts at Commonwealth Home Design have nearly 30 years experience transforming cramped rooms into spacious, open floor plans. Great Falls, VA – An open, spacious floor plan with voluminous ceilings was created through a comprehensive interior gut and remodeling project. Walls and ceiling were removed and replaced with new wood beams and brackets. A new, expansive kitchen and great room were created. Attics can be transformed into a variety of spaces beyond your grandparent’s treasure trove. Home offices, in-law and au-pair suites, recreational rooms and even master bedrooms can be creatively situated in a redesigned attic. Reclaiming existing space under your roof also avoids many zoning and easement concerns common to the Northern Virginia area. There are several considerations when converting attics into new spaces, including building codes; support structures; electrical, HVAC and plumbing systems; and access. Commonwealth’s experienced, solutions-oriented architects can help determine if your attic is ready for a life-changing transformation. 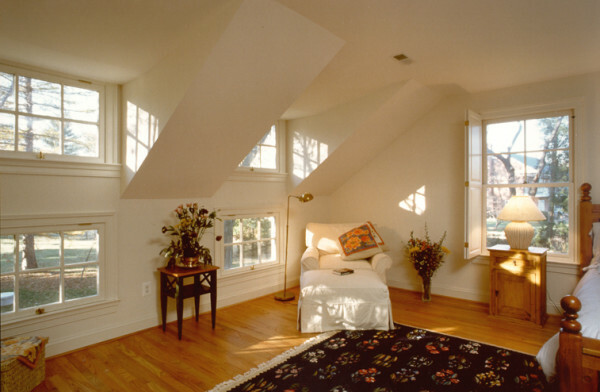 Great Falls, VA – Attic conversion into a Cape Cod-style master suite with sitting area, large bright windows and sloped ceilings. In many cases, you can gain more space from your existing home through an addition project. There are numerous ways to add onto a home. Adding onto and renovating the first floor may allow for an expansive new kitchen; and you know that everyone tends to gravitate towards the kitchen! A sunroom addition can function in many ways. It can be a light and airy, relaxation space with lots of glass and outdoor views, or a great place to mix, mingle and entertain. Second story additions are increasingly popular. Rather than using limited ground area and building a foundation, adding a second floor addition to a ranch house is a great and cost effective way to gain extra space. Master suites are common second story additions, providing more privacy and task-oriented spaces. Second floor laundry rooms are also popular in comprehensive addition projects. Many second story additions are designed above garages. Building over the garage is an efficient way to add space for everything from a master bedroom suite to an office or “bonus room”. Arlington, Virginia – Second story addition with new master suite and multiple bedrooms; bathrooms; and a two-story staircase. Take a look around your home. How many rooms do you really use on a daily basis? Do you have unused sheds or small buildings on your lot? Your family may benefit greatly from a whole house reconfiguration. Unused sitting rooms, mudrooms, extra dining spaces, even under staircase storage areas and small outdoor buildings can be repurposed for today’s lifestyle and possessions. Additional storage can be found in the most creative of locations. Removing walls can increase the natural light into rooms by allowing light to flow through the center of the house from the sunny to the shady side. Sometimes a modest bump-out combined with an interior reconfiguration can work miracles. Older homes in Northern Virginia no longer meet the needs of modern families. But many people like you aren’t ready to pick up and move. Your love your neighborhood and value your investments! Great Falls, VA – Linear design with natural light; contemporary kitchen and family room reconfiguration. Let the design/build professionals at Commonwealth transform your aging house into a luxurious modern residence rivaling today’s new homes!